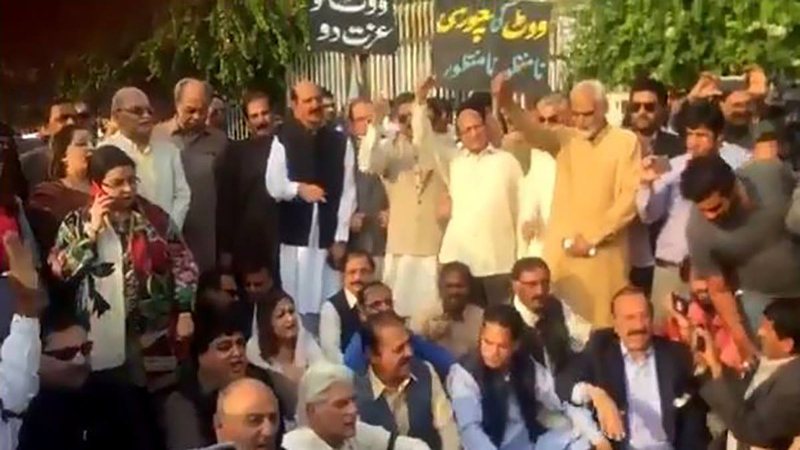 Joint opposition sans the Pakistan Peoples’ Party (PPP) on Thursday staged a sit-in on Constitution Avenue in front of the Parliament House to protest against the arrest of Pakistan Muslim League Nawaz’s (PML-N) President Shehbaz Sharif. Former National Assembly (NA) speaker Ayaz Sadiq presided over the symbolic session. Addressing the participants, Pakhtunkhwa Milli Awami Party Senator Usman Kakar termed the arrest of Shehbaz Sharif illegal and demanded resignation of the National Accountability Bureau (NAB) chairman. “A verdict was announced against Nawaz Sharif and Maryam Nawaz before general elections 2018. The battle is being fought between democratic and undemocratic forces”, Kakar told participants. Keeping verbal onslaught up, Kakar demanded to quash results of “rigged polls” and hold new transparent elections. The PML-N leader, Rana Sanaullah, said there were no corruption allegations against Shehbaz Sharif. “Yet he was arrested and Babar Awan, who is involved in corruption, and the biggest dacoit in Punjab, Pervez Elahi, have not been arrested,” he lamented. “If political victimization is not ended, we will take the protest beyond parliament,” Sanaullah warned. Another PML-N leader Asif Kirmani claimed that the opponents were scared about the outcome of by-elections and that was why Shehbaz Sharif was arrested. PML-N leader Rana Tanveer Hussain condemned the arrest and said Shehbaz Sharif served Punjab to the best of his capabilities. “The entire world praised Shehbaz’s work and acknowledged his good governance. He transformed Punjab during his tenure,” he said.